It had been almost three years since Dean had first noticed the bald patch starting to form on his crown and it had only grown steadily more prominent in that time. As the condition of his hair continued to decline, Dean grew increasingly concerned. It was a friend who recommended Dean speak with an Ashley and Martin consultant. 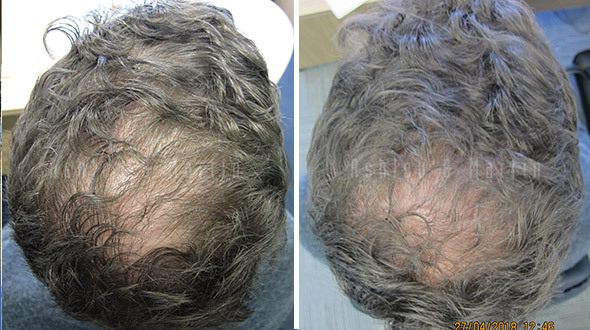 After a scalp examination and comprehensive discussion of his treatment options at his free consultation, Dean decided he would continue the discussion with his own GP instead of moving forward with treatment with Ashley and Martin. He felt he could obtain a comparable treatment alternative at a lower price. Almost a full year passed before the consultant saw Dean walk through the clinic doors again. In that time he had sought and followed advice from other medical professionals, however his condition had continued to deteriorate. He had tried using all the remedies recommended to him in this time, however his hair continued to shed at an alarming rate. Knowing that the RealGROWTH® program was his best chance of halting his hair loss in its tracks and regrowing what he had lost, Dean trusted his consultant’s advice and moved forward with Ashley and Martin. Following the process to the letter, the results of Dean’s medical treatment program were evident in under sixteen weeks. At his first Ashley and Martin Progress Review Dean commented on how easy the whole process of reducing his hairfall and regrowing his lost hair had been. Not only had the program been simple, but the turnaround time from bald to bushy had been surprisingly brief. Dean’s temporal recession had moved forward, the sparse covering over his crown had increased in density dramatically and his overall hair health had improved drastically. There really was no comparison between the results Ashley and Martin had assisted him to achieve in four months compared to the whole year of treatment before RealGROWTH®.